I have talked a lot about gold here. The reason is I am a believer that gold should have a place in the portfolio, not exactly for hedging against information but for diversification. Take a look at the performance of the stock market and gold since 2007, for instance. After reaching the all-time high in October 2007, the Dow has lost nearly half of its value, while during the same gold has actually gained about 10%. Of course, if you only have something like 5% of your portfolio invested in gold (buy GLD from discount brokers for example), the gain won’t do much good to your portfolio as whole if the equity portion of your investment has tumbled 40 – 50%, but still that’s the little help we can always use. At such high prices, gold ceases to have much practical use. There is no theoretical rationale why anyone should even want to invest in it. Gold has value only because we believe it is valuable. It is a collective hallucination. Gold, then, can be considered a currency, unique in that it is not directly tied to any country’s economy. With a global recession that is bound to continue to shake up the purchasing power of all foreign currencies, gold is safer from political and economic instability than cash. What do you think? 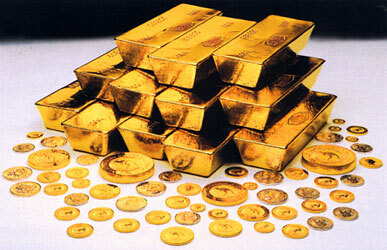 Are you investing in gold in any form, stocks, mutual funds, ETFs, coins, bars, or even jewlery? I agree with Tim. I wrote about “the great gilded bubble” last week on my own blog. Last week I thought I might have been wrong, but thanks to the Fed move this week gold will now increase enough to convince everyone to sell their gold holdings. Though gold has a place in every portfolio, as of today its place is with my shorts. Gold will go up, and by the end of 2009 tank. Look at the stock market, house prices, wow these news agencies including magazines sell such crap to people and we still listen to them. I am not expert on economics but it looks like every time the market does bad that reverse occurs to the price of metal. Also, this is a sneaky strategy for these agencies to tell you not to buy it, while the smart ones buy and then boom a few weeks or months later, they will change their mind and tell us all it is time to buy while the smart ones are selling and making a fortune and the majority is left hanging. I suggest that before you invest in gold that you spend some time looking around the various “buy gold” forums. I’ve never seen such a collection of conspiracy theorists, “end-of-the-financial-world-as-we-know-it” predictors, and general nut jobs gathered in one place. That is enough reason for me to look elsewhere to put my money.